Natural Gas Vehicles (NGVs) have been operating on South Korean roads since 1992, increasing in number after 1997 due to air quality concerns and the focus on Seoul for the World Cup of Soccer, in June 2000. Buses form the majority of NGVs on South Korea’s roads, with 6,600 operational currently and another 2,400 due to be introduced by the end of 2005, rising to 20,000 by 2010. 41 garbage trucks are also operational, with this number expected to rise to 106 by the end of 2005 and 800 by 2010. Recently, older diesel trucks servicing other industries have also been retrofitted to Compressed Natural Gas (CNG) or Liquefied Natural Gas (LNG). Conversions of light duty vehicles and cars have also occurred in small numbers. 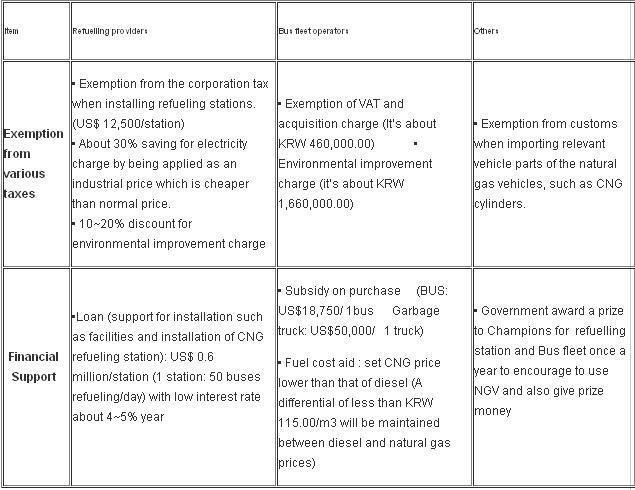 Natural Gas Vehicles in Korea currently use CNG or LNG, however there are already seven districts where the possibility of LFG (landfill gas or biogas) vehicles has been anticipated. Initial applications for LFG are likely to be garbage trucks. OEMs currently supplying NGVs (buses) include: Kia Motors (Hyundai Motor Company), Daewoo Bus Corp, Samsung, and SSangyong. At present there are 97 CNG refuelling stations in South Korea, of which 66 are pipeline or mother stations, with a total of 175 dispensers, and the remaining 31 being daughter stations, with a total of 81 dispensers. The total number of sites is expected to increase to 197 by the end of 2005 and 400 by 2007. With operational considerations taken into account, fuel costs for a CNG bus are roughly half those of diesel, 0.17 € ($US0.21)/km as opposed to 0.344 €($US0.42)/km. The Korean government plays a direct, active and important role, including providing fiscal support through a range of different projects. The main projects include G-7 (G-8) project, Eco-Technopia 21 project, Investment Plan for the Eco-Technopia 21 Project, Major Outcomes of Eco-Technopia 21, Corporate Environmental Management, and Environmental Industry.